Making pancakes from scratch is easier than I thought! 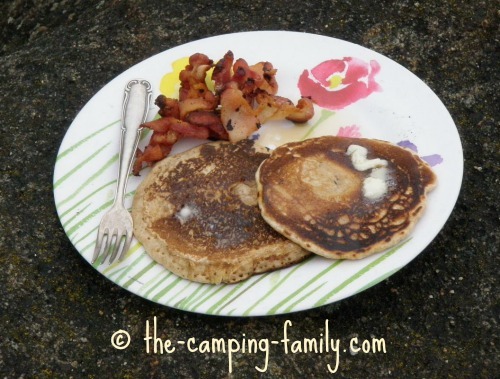 Homemade pancakes are a perfect camping breakfast. 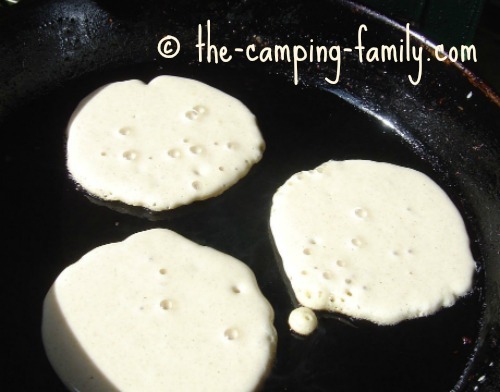 Here's how to make pancakes the next time you go camping. In a mixing bowl or pot, mix with a fork 2 cups/500 mL flour, 1 Tbsp/15 mL baking powder and 1/4 tsp/1 mL salt. Add 2 cups/500 mL milk. Mix well. In a separate bowl, lightly beat 1 egg. Add it to the mixing bowl. Add 1 Tbsp/15 mL oil. Mix well. Add water until you reach the desired consistency. Grease the skillet with a bit of butter or oil. Spoon batter onto the skillet. I can fit 3 pancakes in my large cast iron skillet. Watch the batter. Bubbles will form on the surface of the pancakes, and the edges will get firm. When the bubbles begin to burst, flip the pancakes over. Cook the second side until it is lightly browned. Top with your favorite topping, and dig in! I used to use whole wheat or spelt flour, or a combination. Now that some of us don't eat wheat, I use a combination of rice, oat and sorghum flour. Substitute a non-dairy milk if you like. Rice milk, soy milk or nut milk will all work well. No matter what type of milk I use, I like to get it in a tetra-pack container. 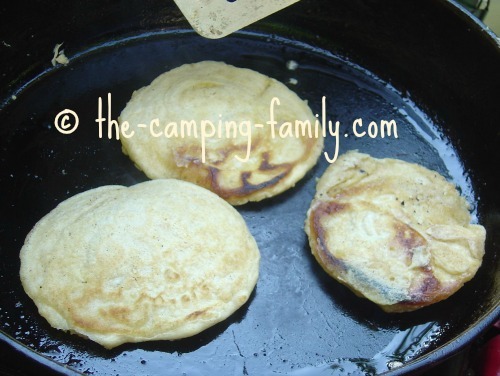 These are perfect for camping because they don't need refrigeration until they are opened. I like to freeze the carton before putting it in my cooler. It keeps the contents cool and thaws by the time I need it. I like using butter to grease the pan. It makes the pancakes nice and crispy. My husband prefers to use vegetable oil. You decide which you prefer! We like to eat our pancakes with butter and maple syrup - but you can use your favorite toppings. Fresh or canned fruit is tasty on pancakes. So is jam. How about peanut butter? The only tricky part of making homemade pancakes is getting the batter at just the right consistency. You want it to be thin, but not overly runny. I haven't told you how much water to add (sorry) because that will depend. You'll probably need between a tablespoon/15 mL and half a cup/125 mL of water. The good news is that even if the batter is too thin or too thick, the pancakes will be good anyway! The next time you make them, you'll know exactly how much water to add. This simple pancake recipe makes about 15 medium-sized pancakes. It is easily doubled. 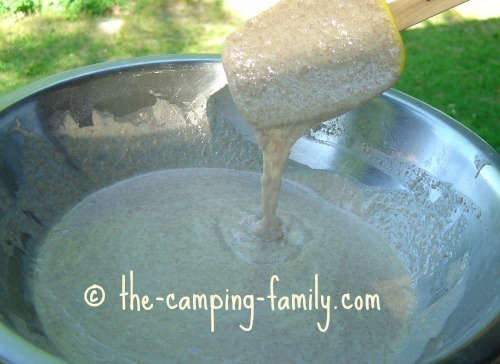 This pancake mix recipe is not just for camping! It's easy to make pancakes from scratch at home, too. If you have extras, just put them in a freezer bag and pop them in the freezer. 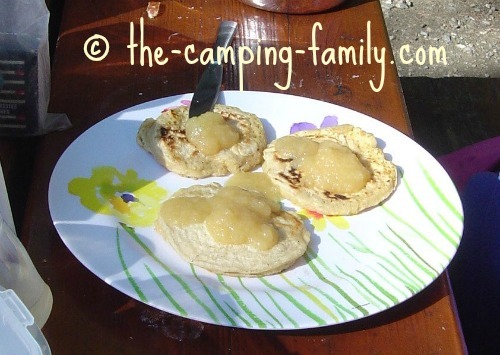 Pull out your homemade toaster pancakes when you need a quick and easy breakfast. Just thaw them (in the microwave, or in the toaster on its lowest setting) and then toast them. They are great! I hope you'll enjoy making pancakes from scratch! What about a shake-and-pour pancake mix? Perhaps you've heard about this idea: you mix up all of the ingredients at home and store them in an airtight jar. 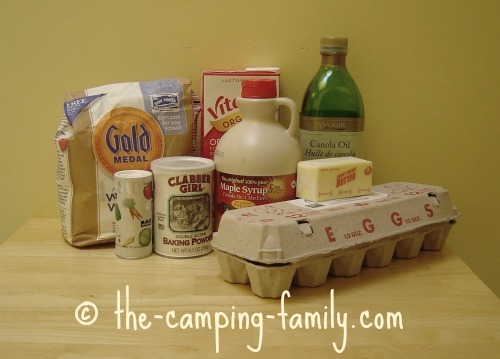 At camp, all you do is add an egg and some water to the jar, shake it vigorously, and pour the batter into the skillet. I've tried shake and pour pancakes, and while they are fun and easy to make, I don't think they taste as good as regular pancakes from scratch. If you'd like to try a shake and pour pancake mix, here's the recipe. 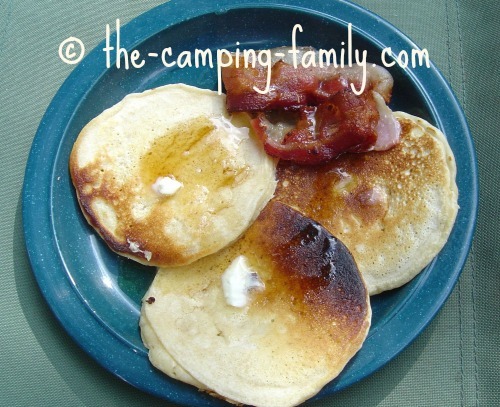 Now that you know how to make pancakes from scratch, check out more easy camping recipes here. Are you planning a camping trip? 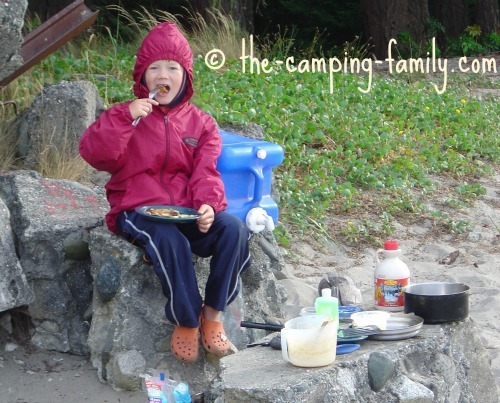 Remember to visit The Camping Family home page before you go. You'll find lots of helpful information for making your trip a success.